P.A. Nisbet spends long hours in the Grand Canyon and remote regions of the West, hiking, camping, and painting. His painting, Morning on the Colorado, captures a quiet stretch of the river as it continues to grind down the Grand Canyon. The painting epitomizes his passion for the landscape, which he describes poetically: “When I imagine the story of my own life, I see only this: A vast chromatic distance, a layered, transparent landscape, and a journey without a destination through great vaults of stone, light and space.” Morning on the Colorado won the Henry Farny Aard for Best Painting at the 2009 Quest for the West exhibition at the Eiteljorg Museum in Indianapolis, Indiana. 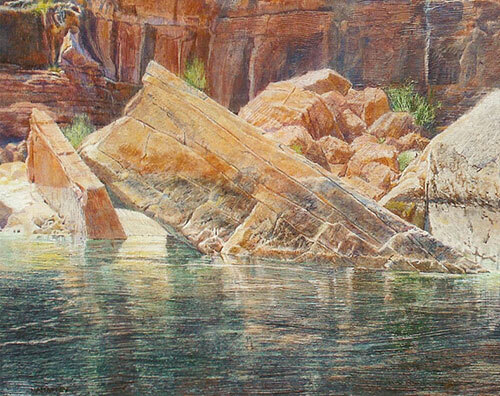 Merrill Mahaffey shows the results of river erosion in his painting Unstable Rocks calmly reflecting on the river’s flowing surface but ready to wreck havoc. He describes himself as a “spiritual naturalist.” Fascinated by the tumbled rocks of the Southwest, he describes his work as “a link between aesthetic and environmental concerns (bridging) realism with fractal modernism in an ever-evolving style…” In Unstable Rocks, he isolates the scene from its greater context and concentrates on geometry and subtle contrasts. “Sometimes I put little stones, bones or pieces of glass and plants into the paint, in the same spirit as the Navajo weaver who incorporates things into her blanket to bless those who will receive it, and as a way of acknowledging the temporality of things,” says McElwain. Her painting Cañon captures the energy of the flowing river and its effect on the rock walls with her characteristic thickly applied paint and strong color.